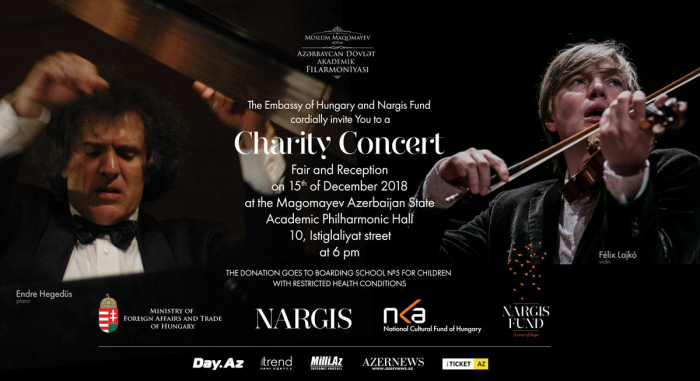 A Charity Concert and holiday fair organized by the Embassy of Hungary and Nargis Magazine and Fund took place at the State Philharmonic Hall on December 15. Two world famous Hungarian musicians, Endre Hegedűs, pianist and Félix Lajkó, violinist staged musical performances bringing to Baku the spirit of holiday season through their music. More than 400 people, including the children and the teachers from the Republican Boarding School No. 5, attended the event. Besides the musical experience, the guests could taste and buy Hungarian specialities, such as the famous Hungarian salami, paprika, chocolates and nicely decorated Christmas gingerbread. There was also an opportunity to taste premium Hungarian wines. All proceedings from the tickets and gift sales went for charity, 8.500 AZN were collected, and this sum is donated to the Republican Special Boarding School № 5 for blind and partially sighted children. The donation will be used to buy Braille boards that will improve reading and writing skills of the children.